Mike Bara's work is going to split opinion. He presents his strongly held views on a variety of matters in a bold manner. You're either going to love it, or hate it. 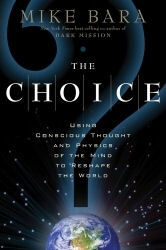 'The Choice' is a follow-up to the best selling book 'Dark Mission', which Mike Bara co-authored with Richard Hoagland. It makes many references to material in this earlier work, and Richard Hoagland's influence is evidently very profound. Ostensibly about planetary science, 'The Choice' presents an alternative view to science about the role of the planets - and more distant energy sources - in the destiny of our world. Yikes! Perhaps Mike Bara is simply reflecting the America of modern times: increasingly divided, and angry at institutions of all descriptions, whether political or academic. Once you get past the author's anger, much of the book is fascinating. There are many alternative ideas discussed about the origins of the solar system, the inter-relationship between planets and the Sun's cycles, and how planetary alignments may be far more significant on a physical level than is generally recognised by science. The concept of torsion is an interesting one, worthy of investigation. If the Dark Star is in Sagittarius, which I have maintained for some years, then it will be aligned with the galactic centre, Earth and the Sun during the period of the annual winter solstice. Perhaps it acts as some kind of lens to the energy from the centre of the galaxy, or merely adds its own local output. Either way, this is a concept deserving of some thought. The book generates many questions for inquisitive minds, and in that sense does what it says on the tin. I welcome this, because it makes the reader think, and wake up. However, it is also peppered with highly debatable points, and even misrepresentations about scientific knowledge. So, as a reader, you have to tread carefully through this minefield of alternative knowledge, and be discerning about what you're taking in. It is right to question science, but it is also right to question the inquisitors of science. I wish his short bibliography more accurately reflected his broad reading, and his chapter references were more extensive and representative of the knowledge Mike Bara draws upon. The discussion in Chapter 14 concerned itself with the material on the Dark Star website, but my book, and the contribution of other researchers in the field, were not mentioned (even though the 'Dark Star' moniker was). Academically, this was sloppy - but then Bara has a poor regard for academia, as we've already seen. This sloppiness was compounded by the number of grammatical errors that got through the editing net (my favourite was "A growing number of Americans are questioning the very basic tenants of our society..." (p161)). Where Mike Bara shines as an author is in his discussion of ancient culture, myth and comparative religion. I enjoyed his enquiry into how the ancient calendar cycles provide us with much to ponder in our modern age - particularly Mayan, Hindu and Hopi knowledge. His attitude towards 2012 is ambivalent, and his whole focus here is more measured and reasoned. He explains quite complex material well, and his material is generally insightful. Where his science-based material is influenced by Hoagland, these sections of the book draw much from Carl Johan Callemann, whose work he clearly admires. I applaud Bara's multi-disciplinary approach in this area. 'The Choice' neatly brings together many aspects of the current 2012 debate. Bara sensibly shies away from predictions of what the end of the Mayan Long Count will bring, and opens up an array of chronologies that even bring the exact date into question. The question of 2012 is a muddle, and he's right to paint it as such. His answer to the conundrum is a spiritual one, which is woolly, but will find broad appeal. 'Subtitled "Using Conscious Thought and Physics of the Mind to Reshape the World"